You get a daily dose of whats cooking on air, from the hot topics to the cool music.The big breakfast show is guaranteed to keep you wanting more with laughter. So don’t skip! If you wake up moody, grumpy or even sad you are guaranteed of a mood boost by the big breakfast duo. They definitely will send your mood on a high note because they are loud, fun and funky. This team definitely brings it like its never been brung, and for this reason all your morning are guaranteed to be bright and fun. The big breakfast team hosts a program or show called 5 things you need to know, this show is a general knowledge booster. Power FM being a youth station, there is edutainment about weird, crazy facts. People who don’t tune into the big breakfast show tend to miss out on a jam packed breakfast that is served by the baddest powerfm duo: Butterphlyphunk and Elder Squaila. 6. Hot Gossip Updates . Butterphly and Elder Squila are very much aware of how much listeners are thirsty for gossip. As such, they got radio lover covered. 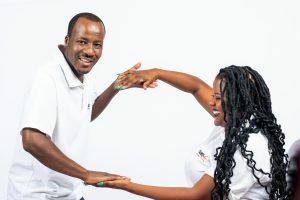 They cover it all, human interest stories to stories that are in the public interest, so there is no excuse for one to miss a day of served big breakfast by the big two breakfast power FM personalities.